Authorities crack down on businesses for not keeping eggs refrigerated, destroy 6,000. In an operation on Tuesday night, Israel Police officers, Tax Authority supervisors, and Egg and Poultry Board members raided several businesses who were selling unsupervised eggs. 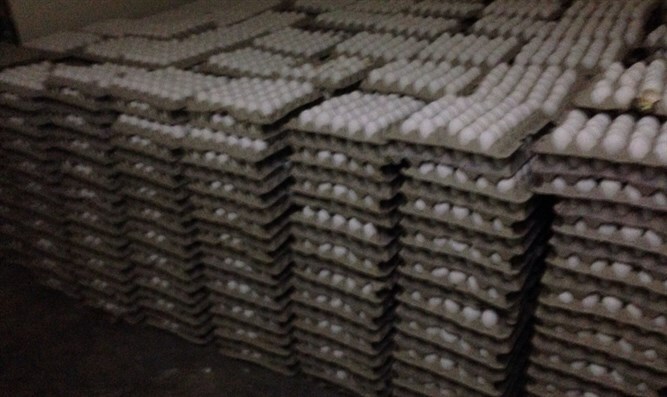 The eggs - 6,000 of them - were being stored in unsatisfactory conditions and were not refrigerated. Board members who checked the eggs ruled that they were unfit for human consumption. Nine suspects have been detained on suspicion of maintaining and selling eggs which are unfit for use. The eggs themselves were confiscated and destroyed by the Egg and Poultry Board. In addition, six tons of non-kosher meat were destroyed in a butcher shop in the Arab town of Sakhnin. "Israel Police and other enforcement authorities will continue the determined battle against those who market unsupervised foods, especially animal products which may be affected by by avian influenza (bird flu), salmonella, and other bacteria," an Israel Police spokesperson said. "We suggest the public only purchase food in places which are known to be under supervision. In addition, make sure to buy food only in its original, closed, clean packaging, and check to make sure there are clear manufacture and expiry dates. "We emphasize that improperly supervised foods are often transported in unsanitary conditions and may be infected with diseases which endanger the public health." In June, Arabs attempted to smuggle 9,000 eggs over the security fence, and in December, Border Police officers discovered 9,000 eggs hidden under the seats in an unauthorized minibus.